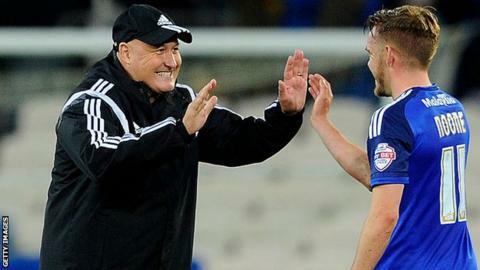 Manager Russell Slade says Cardiff City cannot afford any slip-ups between now and the end of the season. The Bluebirds have six Championship games remaining and are looking to make up a four-point deficit on fifth-placed Derby County and a six-points arrears on fifth-placed Sheffield Wednesday. "We can't afford too many slip-ups, that's for sure. We need to get as many points from these 18 points that we've got left," he told BBC Radio Wales. "We know football can be very cruel." Slade's side lost ground on the top six and a play-off berth on Tuesday despite an impressive 0-0 draw with leaders Burnley, now unbeaten in 17 games. Cardiff face Fulham at Craven Cottage on Saturday with Slade saying any set-back would be a problem. "If we did slip up it would put more pressure on us to produce in the remaining five games," he said. "We're in a good place, that's the important thing. When that pressure mounts and you're running out of games, it gives you a real focus and concentration and desire to achieve something. "I am looking forward to the challenge and I think the players are as well. "We have set a standard now, so we need to maintain that." Slade feels it will be key to Cardiff's chances to stop Fulham's prolific strike force as they visit west London. Ex-Cardiff favourite Ross McCormack in the second-highest scorer in the Championship with 21 goals, while reported Tottenham-target Moussa Dembele has 14. "Ross McCormack is in great form. We know how strong he is from any dead ball situations outside the box," Slade confirmed. "He's a very, very good finisher and he's got Dembele alongside him and they seem to have a partnership that's flourished. "If we can isolate their front two, who have scored the majority of their goals and we can deal with them, then we're going to give ourselves a very good chance of winning." Slade has also dismissed newspaper speculation that defender Bruno Ecuele Manga is set for a summer switch to Premier League Bournemouth. The Cherries are managed by Eddie Howe, a close friend of Slade's. "I know Eddie really well; we speak every other week, so I am sure if there was something in it, he would have mentioned something," he said. "It is probably someone just being a bit mischievous I suppose, but you are going to get speculation from time to time."